Prime Minister Sheikh Hasina today expressed her firm optimism against the return of killers reign saying the people of Bangladesh would not let the nation plunged into their grasp ever in future. “Reign of killers will never return to Bangladesh . . . the people will not allow them to grab the power again,” she told a National Mourning Day discussion organized by Awami League at Bangabandhu International Conference Centre (BICC). The premier, however, simultaneously sought people’s vigilance “as a vested quarter is genealogically conspiring against the country to play foul with the people’s fate”. Mujibur Rahman’s 43rd martyrdom anniversary, reports BSS. “Those who want to make their gain keeping the gun on children’s shoulder actually want to push the country to darkness,” she said in an oblique reference to vested groups’ infiltration to the young students’ campaign for road safety. She said those who killed Bangabandhu and the four national leaders in their desperate effort to erase all spirit of the Liberation War “don’t want to change the people’s lot in this country” though the independence came under his leadership to change the lots of every downtrodden people. “A group of people joined the war of liberation. But they had no faith in the spirit of the war,” the premier said. Awami League’s Advisory Council member Tofail Ahmed, Presidium members Advocate Sahara Khatun and Mohammad Nasim and General Secretary Obaidul Kader and Awami League-led alliance partner Bangladesh Samyabadi Dal’s General Secretary Dilip Barua, spoke on the occasion. “Reign of killers will never return to Bangladesh . 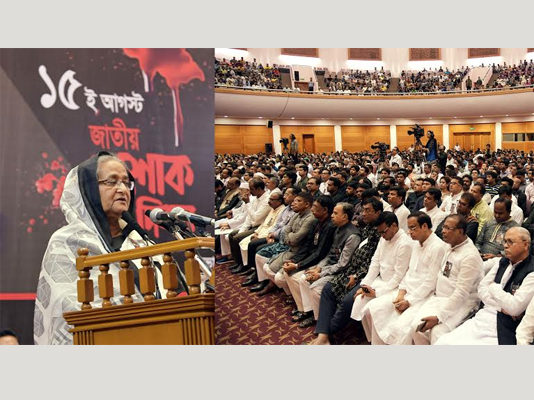 .
. the people will not allow them to grab the power again,” she told a National Mourning Day discussion organized by Awami League at Bangabandhu International Conference Centre (BICC).